These Keto Jalapeno Poppers smell heavenly as they cook. The superbowl wouldn't be complete without some keto jalapeno poppers on the menu. There's something about the superbowl--whether you're watching for the football or the advertisements--that demands some indulgent treats. These keto jalapeno poppers are a long-time favorite. We learned how to make these from my brother-in-law. Icase you're wondering. I did not suddenly bulk up and grow dark hair on my arms!! Ha!! This video stars my husband--cause these are one of his favorite treats and he wanted to show you how to make them. They are easy to assemble and have only three ingredients. Warning!!! Don't touch your eyes!! You would think this is obvious--right? Well, we have both made that mistake while making these. Wash your hands in between steps just in case you inadvertantly rub your eyes. Eeek!! Watch closely during the last ten minutes. Tip: Broil at the end for a few minutes for crispier bacon on top! If you like your bacon crispy. Take these off the baking sheet and crisp them up in a pan on the stovetop for 5 minutes per side. Alternately, you can cook them on the stovetop in a heavy cast iron pan the whole time. If you have an air-fryer, like this one, use it!! These keto jalapeno poppers work well in the air fryer! They take about 20 minutes at 370 degrees in our air fryer. Find more details at the end of this post. This low carb jalapeno popper recipe is so simple and delicious that it will become a tradition in an of itself! All you need is jalopenos, bacon and cream cheese. Preheat your oven to 350 degrees. See recipe notes for alternate cooking instructions. Cut jalapenos in half and remove seeds. You should have 18 jalapeno halves. Fill each jalapeno half with a portion of cream cheese. Divide the cream cheese equally among the 18 jalapeno halves. Wrap each jalapeno with a piece of bacon. You can secure the ends with a toothpick if you can't get the bacon to stay put. Place each bacon wrapped jalapeno on a cookie sheet. Place cookie sheet in the oven for 25-30 minutes. Jalapenos should be fork tender and the bacon should be cooked. At first I was going to leave out this section because this recipe is so simple. Then, I realized that this recipe features a few kitchen items I wouldn't want to be with out. First, the ceramic baking sheets we use to bake these. They make clean-up an absolute breeze. We use them constantly and replace them every few years as they tend to get scratched up from things like kids using pizza cutters right on the sheet! Finally, a good cast iron pan is essential in the kitchen. We prefer the Lodge brand over other brands. When we run out of our favorite bacon (which happens as soon as we get it..nom nom nom), we get this bacon from Sam's Club or Costco. (link is to Sam's Club). The butcherbox bacon is WAY better. 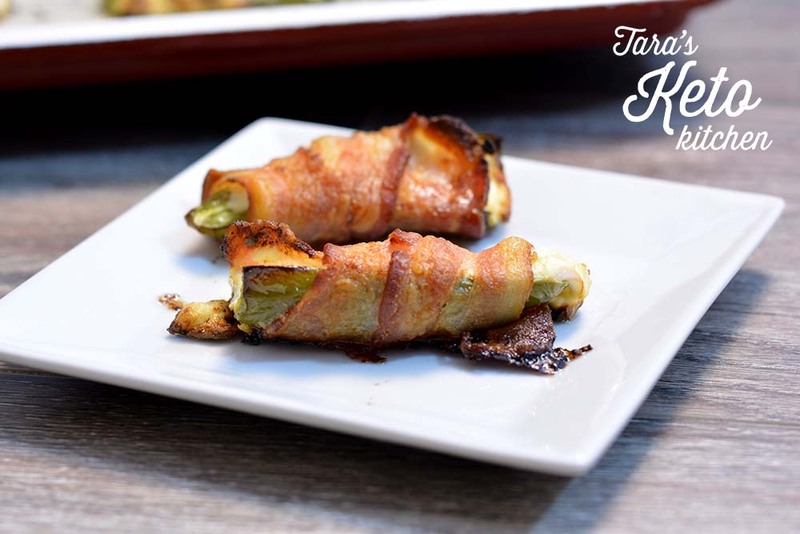 There are two other cooking methods that work well with these keto jalapeno poppers. They are much harder to film! To cook these in a cast iron pan, preheat the pan on medium-low while you prepare the jalapeno poppers as instructed. Then, place the poppers in the cast iron pan and cook approximately 10 minutes per side. Keep a close eye on them so that they don't burn. We purchased an air fryer about 4 months before we jumped into a Keto lifestlye. Turns out, it was a great purchase anyhow! An Air-Fryer is fantastic for cooking bacon. And especially fantastic if you like crunchy bacon. Place these in a single layer in your preheated (370 degrees) air fryer and bake for 15-20 minutes or until you are happy with how cooked the bacon is. Do you like bacon crispy? or soft?? Comment below and tell me! P.S. They don't sell the exact air fryer we have. Here is one very similar in size to the one we purchased. I've also linked to another one on Amazon that's really well rated earlier in this post! Tara, what a fantastic recipe you have here! It looks so easy and healthy to prepare! Definitely, a must try one! Easy. Delicious. My new favorite Keto app!